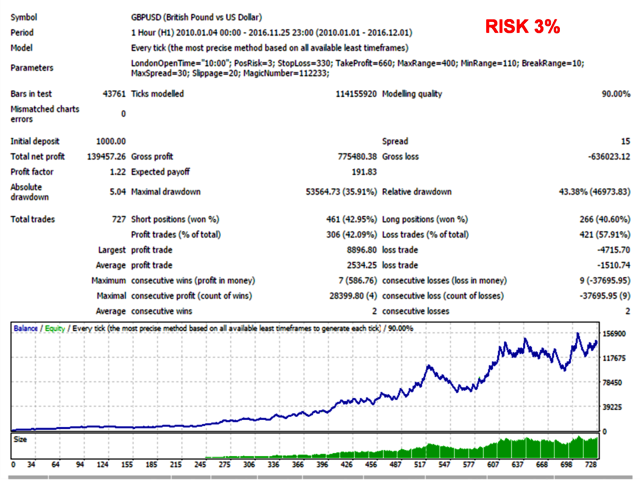 System of automatic trading during the London Session which uses a strategy to identify a valid trading range in the intraday timeframes and awaits the breakout to open position. 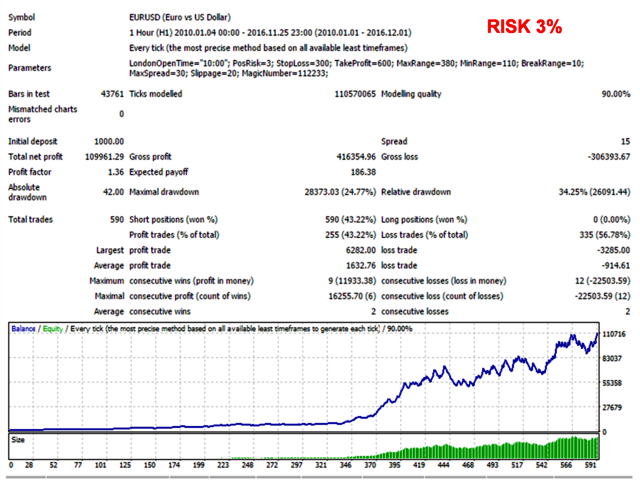 This multicurrency Expert Advisor performs better on the EURUSD, GBPUSD, EURJPY, GBPJPY, EURAUD, CADCHF, USDCHF, USDCAD, EURCAD and USDJPY pairs. The EA settings files (*.set) for each pair are attached. After identifying a valid trading range, the EA waits to open position at the breakout of that range. It is already optimized to identify the best opportunities in the appropriate intraday timeframes, that is, the user can attach it to the chart of the symbol that wants to trade in any timeframe and will have the same results. The trading robot is highly reliable and has been developed considering trading on a real account. 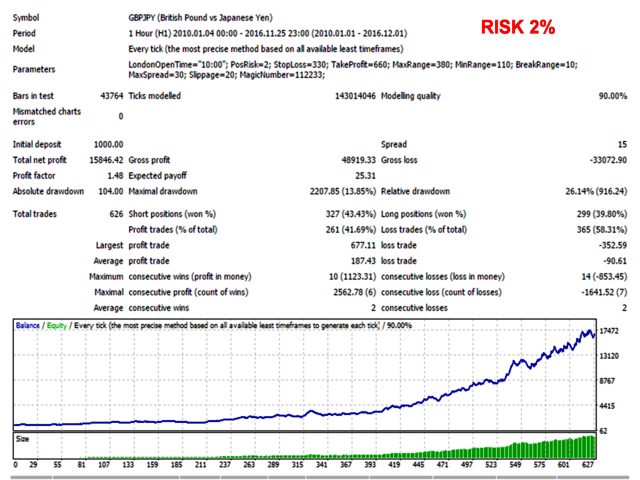 The money management system allows the users to define exactly how much they want to risk in each operation. Each open position is protected by stop orders (Stop Loss and Take Profit). 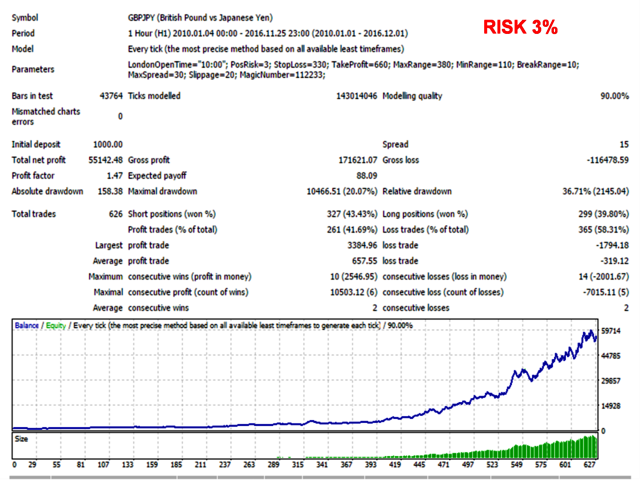 During testing, the relationship between risk and return was defined as 1:2 (the projected return is double the risk) and the average rate of operations with profit was over 40%. That is, considering the risk of 2% of the account balance, every 5 open positions, on average, it lost 3 (-6%) and won 2 (+8%), making a profit of 2%. Spread: During testing, the spread of 15 points was used. 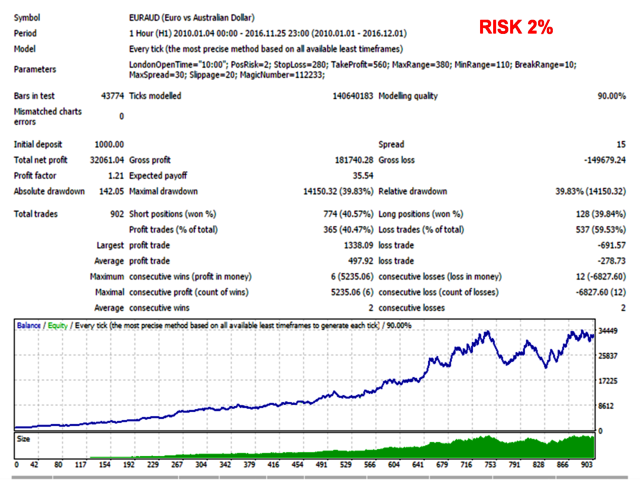 Too high spreads can compromise the efficiency of the strategy. 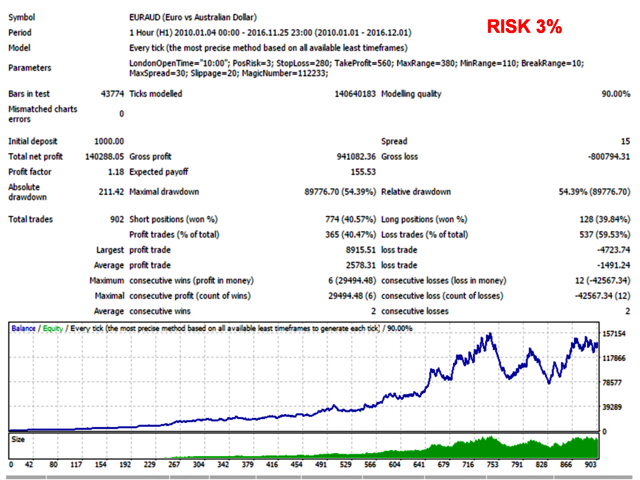 Risk: Higher risk can enhance profits, but also entails higher drawdowns. Users with the most conservative profile can prefer to work with the risk of 1% or less. 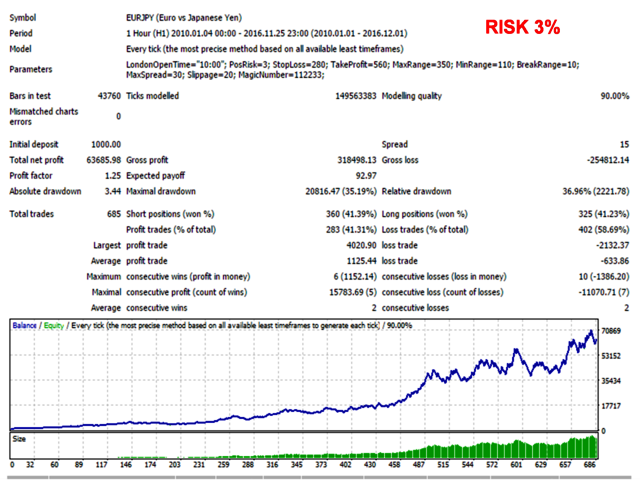 Magic Number: identification number of positions opened by trading robot. Tests were performed in the period from January 1, 2010 to December 1, 2016 (83 months) considering initial deposit of $1000.00. Inputs: The EA settings files (*.set) for each pair are attached.